Derby Museum and Art Gallery has bought a sculpture by David Payne. David Payne was born in 1843 in Annan, Drumfies the son of a mason. On moving to Derbyshire in 1869 he became apprentice to the Derbyshire artist George Turner and worked alongside Louis Bosworth Hurt. Payne was known for his Trompe L’oeil’ pictures but became more successful with his rural idyllic landscapes. He lived in Burton on Trent before moving to Duffield and then Derby in 1888. 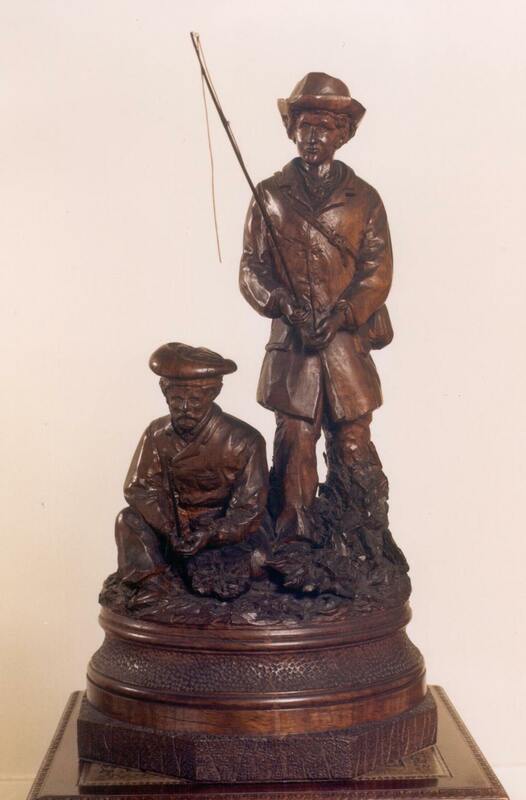 This new acquisition of two anglers carved from wood won him the Industrial Art Prize at Derby Corporation Art Gallery in 1882. It was purchased with the medal he also received. On the occasion of Queen Victoria’s visit to Derby May 21st 1891, Payne painted the celebration in Market Place. This painting is in the collection at Derby Museum and Art Gallery. He died in Sheffield in 1894.